K-9 Axe had served with the St. Clair Shores Police Department for two years. Image courtesy of ODMP. 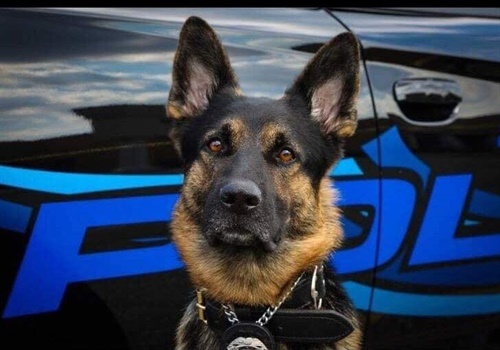 A K-9 with the St. Clair Shores (MI) Police Department was shot and killed on Sunday while tracking a suspect who had allegedly brandished a gun at a social hall in St. Clair Shores. Police were called to the scene, and saw a man matching the description outside the building, according to ClickOnDetroit.com. Police said he ignored multiple demands from officers and fled from the scene on foot. K-9 Axe was deployed for an apprehension and was shot by the man. Police returned fire, striking the man. He was transported to a nearby hospital, where he was pronounced dead. K-9 Axe had served with the St. Clair Shores Police Department for two years. The K-9 was named in memory of U.S. Navy SEAL Petty Officer 2nd Class Matthew Axelson who was killed in combat in Afghanistan in 2005, according to ODMP.